After the designing the Madly In Love Cowl/Infinity Scarf and Madly In Love Hat, I kept getting one more request – fingerless mitts to match! Et voila! 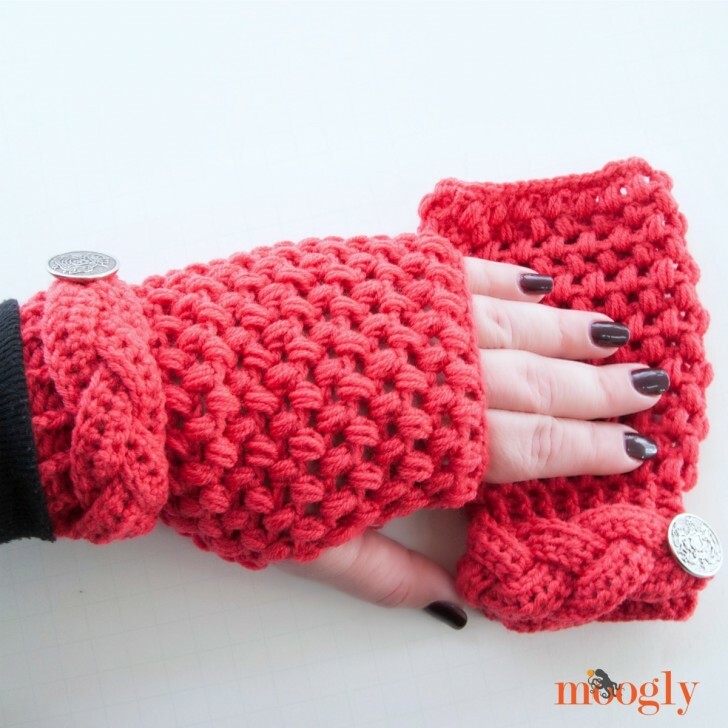 These lovely free fingerless gloves feature the gorgeous braid and fun puff stitches of their predecessors, and come in two sizes – teens and adults. And they are pretty darn cozy too! Helpful Video Tutorials: FDC (foundation double crochet); fpdc/bpdc (post stitches); extending a row with foundation stitches; FHDC (foundation half double crochet); puff st (also see stitch definition below); joining foundation stitches to work in the round. 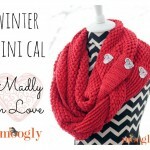 Make it a Set with the Madly In Love Cowl/Infinity Scarf and Madly In Love Hat! Special Stitch: Puff Stitch – *Yo, insert hook in indicated stitch, pull up a loop to the full height of the stitch; repeat from * twice more, until 7 loops are on the hook, yo and pull through all 7 loops. NOTES: Beginning with Round 3, this pattern is mostly worked in turned rounds. This means that you join as usual for working in the round, but then turn to work from the opposite side, as if you were working in rows. Use a stitch marker to keep track of the first stitch of each round if needed, and be sure to read the instructions carefully. The right and left mitts are made the same, it’s not until the braids are sewn down with the buttons that they are different. Round 4 – 7: Repeat 2 – 3 twice. Go to FINISHING INSTRUCTIONS below. For Right Mitt, with thumb hole on the left, braid extended FHDC row together, and sew to the right side of the cuff as shown, with button and leftover yarn. For Left Mitt, with thumb hole on the right, braid extended FHDC row together, and sew to the left side of the cuff as shown, with button and leftover yarn. Use 12″ tail from the beginning of the pattern to close the bottom of Round 1 (see linked helpful video tutorial above), and then close up any holes that show next to the beginning of the braid. And that’s it for the Madly In Love Collection – unless there’s something you think is missing! Be sure to let me know if there’s some other piece you think this collection needs. And if you’ve read this far… did you spot my goof? 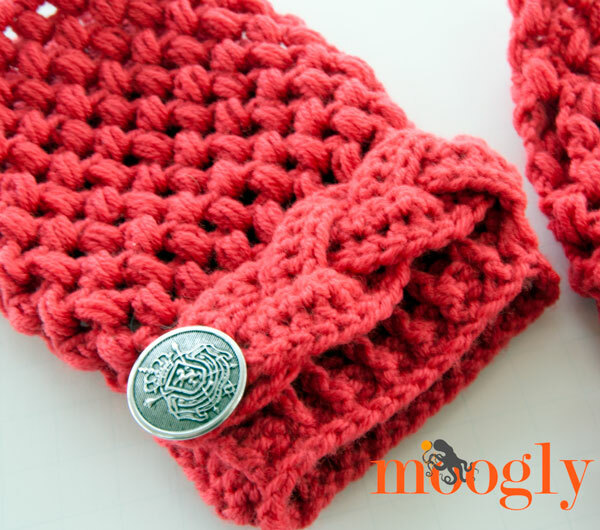 I grabbed two buttons from my button box to finish these mitts off (trying to use up some of the ole button stash)… and it wasn’t til I was done that I realized they are two different buttons! So close, but just a leetle bit off, heh. But they still look good in my opinion – and hopefully yours as well! 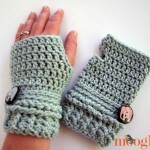 I hope you enjoy this free crochet fingerless mitts pattern! 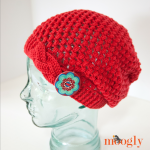 Okay, love all 3 “Madly in Love” patterns! How many skeins of the Lion Brand Superwash Merino should I order to complete all 3 patterns? Great pattern. i would like to have a go at these.! Oh those look so gorgeous! 😀 Thank you so much Ginny! Ah, boot cuffs! 😀 Thank you Lynn!! How difficult would it be to make this into mittens? 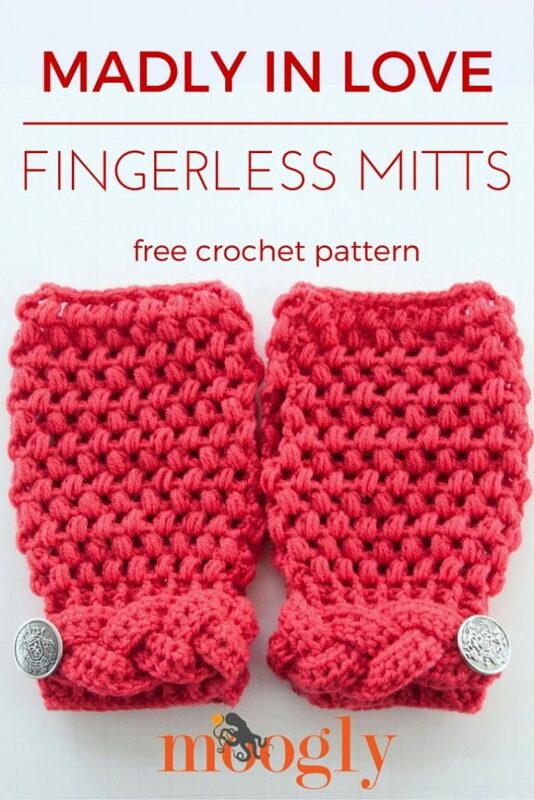 I’m not a big fan of fingerless mitts. I love your patterns! Thank you Cyndee! Just continue working your way up to the fingertip, decrease a little bit, and then seam. The Hello Gnome Mittens should help! Is the infinity scalf the one with the 3 braids and buttons ? 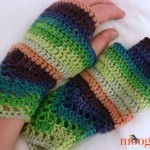 That is the one that matches these mitts, yes. 🙂 There’s a hat too!